Animal Wildlife | Smilodon (Sabre-toothed Tiger) | The Saber Tooth Tigers are some of the best known and most popular of ice age animals. They are among the most impressive carnivores that ever have lived. 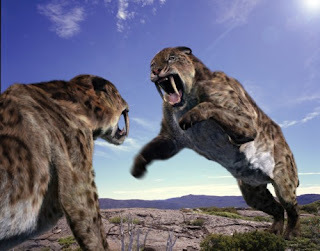 Two different types of saber toothed tigers lived in the mid-western U.S. at the end of the ice age. 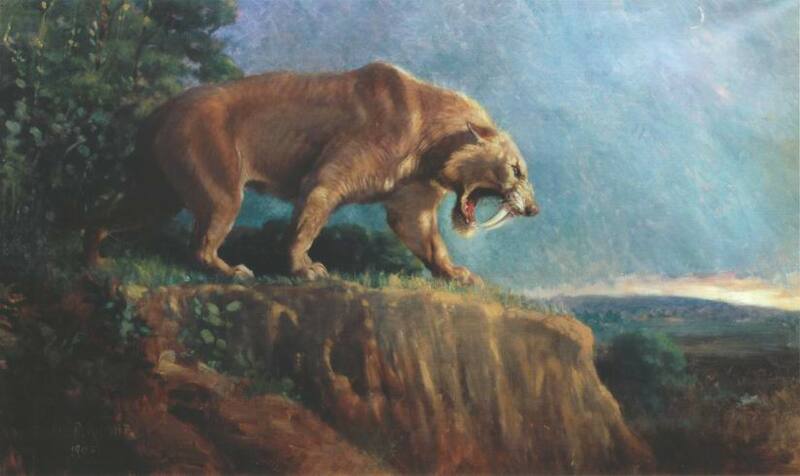 One of the most familiar saber tooth tiger was (genus Smilodon). These cats had enlarged canines usually associated with the name saber tooth. Their canines were up to 7 inches long (18 centimeters)! The second type is the less known (genus Homotherium). These cats had shorter canines about ten centimeters (4 inches) long. The canines were also flatter at the tips. 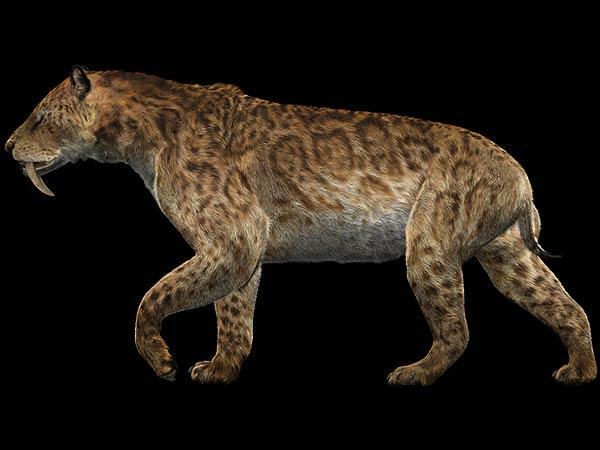 Some of the differences can be seen by comparing the homotherium cat to the smilodon cat. The sabre-toothed tiger is one of the most well-known prehistoric animals along with giants such as the woolly mammoth. Sabre-toothed tigers roamed the mid-western US and parts of both North and South America and were named for the enormous canines which skeletons show, protruded quite far out of their mouths. Despite it's name, the sabre-toothed tiger was not actually related to the modern tigers that are found throughout the jungles of Asia. 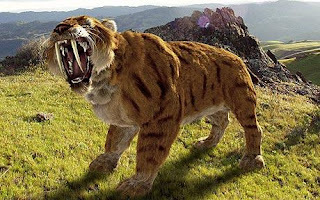 It is thought that the sabre-toothed tiger would have roamed across the grassland plains and open woodlands throughout both North and South America where individuals would of varied slightly depending on the area which they inhabited. The sabre-toothed tiger is one of the best known ice-age animals but little is really known about them as they are thought to have become extinct around 10,000BC which is a long time ago. 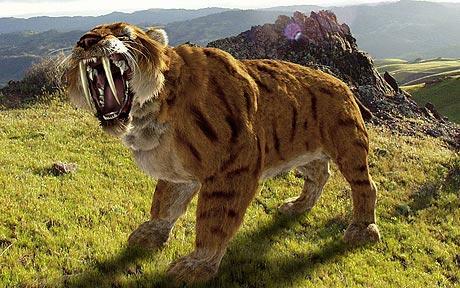 The sabre-toothed tiger was named for the canines that could grow to more than 7 inches in length and were capable of fatally wounding their prey with one bite. Sadly, the colour of the sabre-tooth tiger is unknown but it is thought that is would of been of a similar colouration to the modern day lion found in Africa (and which it is not closely related to). The sabre-toothed tiger also had a powerful, muscular body which meant that it could quickly catch and pounce on it's prey before using it's knife-like teeth to cause to the fatal blow. 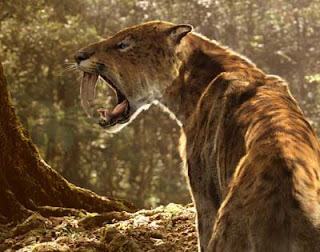 In the same way as modern day felines, the sabre-toothed tiger was a carnivorous animal and would of been the most dominant predator within its environment. Large herbivorous animals such as deer and bison would of been the most common prey of the sabre-toothed tiger along with occasional giant such as a small woolly mammoth should their ranges cross, although their exact diet is unknown. The sabre-toothed cat would of been the most ferocious and therefore the apex predator within it's environment so had no natural predators on the American plains. Humans are thought to be the most likely cause for the demise of this enormous cat and more than 2,000 sabre-toothed tiger skeletons have been found emerged in the tar pits close to Los Angeles. As with modern felines, the sabre-toothed tiger would of bred in the warmer months of early spring, when after a gestation period that could last as long as 8 months, the female sabre-toothed tiger would give birth to an average of 3 cubs per litter. Nothing is known about sabre-toothed tiger cubs but they could be born blind like the cubs of today's felines. The sabre-toothed tiger is thought to have become extinct more than 12,000 years ago when human settlers first arrived in the Americas, hunting this species to extinction. Although climate change could also be the primary cause for their demise, little however is really known. 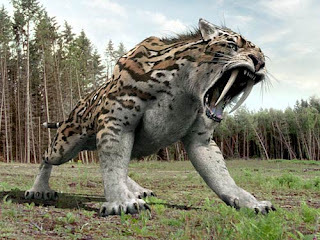 0 Response to "Smilodon (Sabre-toothed Tiger)"